Valbray is an avant-garde boutique brand featuring a signature dial design, inspired by a camera, with an interactive aperture shutter system that opens and closes with a twist of the bezel. The story of luminous-dial watches hasn't always been sunny. At the turn of the twentieth century, female workers painted watch dials with luminescent radium by shaping the camelhair brushes between their lips between strokes, having been assured it was safe to ingest. They came to be known as the Radium Girls in the 1920s when they sued their employer for their resulting illnesses and won, triggering a wave of worker protection legislation. Radium has been banned since 1968, but in the past half century, the watch industry has developed safe illuminating materials, such as tritium and phosphorescent Super-LumiNova, which light up dials after dark or in the darkest depths of the sea, as well as delighting the eye. For more than 10 years, Ball Watch has used tiny glass tubes filled with gaseous tritium (an isotope of hydrogen), another radioactive element. Safely contained, the tritium molecules emit bright light when they strike the colored interior surfaces of the capsules, and can do so for more than 20 years. This system generates light that is as much as 100 times brighter than other methods, and unlike photo-luminescent materials, such as the market-dominant Super-LumiNova, it does not need to be "charged" with exposure to UV light. Photoluminescent materials absorb light and then reflect it back for a time, while the tritium gas tubes are self-illuminating. This year's Engineer Hydrocarbon AeroGMT ($2,999) applies the H3 micro gas tubes to the rotating bezel marked with a 24-hour ring that indicates a third time zone in addition to the green-glowing GMT hand. The robust 42-mm stainless steel aviation watch can take shocks of up to 7,500 Gs, and resists magnetic fields up to 4,800 A/m. While Ball's designs are conventional, Valbray is an avant-garde boutique brand featuring a signature dial design, inspired by a camera, with an interactive aperture shutter system that opens and closes with a twist of the bezel to reveal a dial below. The Oculus CV.01 Chrono-Hypnosis ($15,650) opens to an integrated dial on a phosphorescent Super-LumiNova base in blue or orange, each limited to 100 pieces and overlaid with a honeycomb grille. A Valbray-finished Valjoux chronograph movement, visible through a sapphire crystal case back, beats inside the black DLC-coated titanium case. 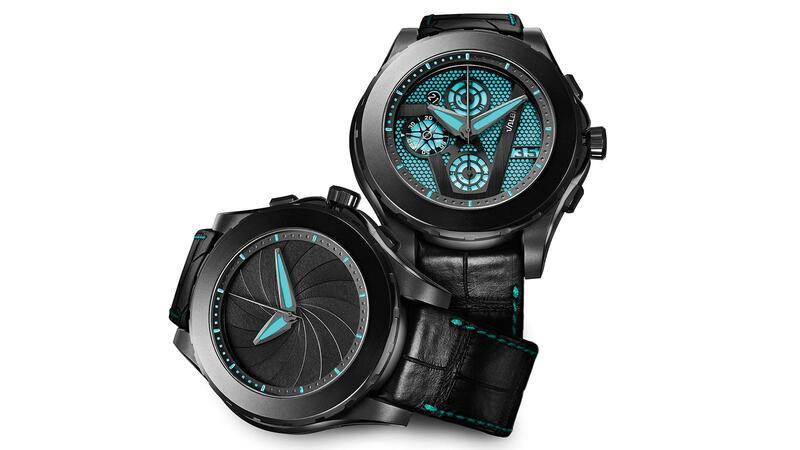 Known for his distinctive moon-phase designs, Finnish watchmaker Stepan Sarpaneva partnered with Black Badger Advanced Composites to create the Korona K0 Northern Lights (about $16,200), a trio of moon phases that glow in green, blue and violet, each limited to eight pieces. Rather than use a luminous coating, the dials are sculpted from an innovative luminous solid composite material that is combined with Super-LumiNova indexes and hands, while the beautifully engraved moon faces softly shimmer in traditional 18-karat red or white gold. Visit ballwatch.com, valbray.ch, and sarpanevawatches.com.